If you don't know who those people are or what any of that means, don't feel bad: this is something of a rarity, the first Minimate ever based on a novel - specifically, on Goth Girl Rising, the sequel to the popular young adult book The Astonishing Adventures of Fanboy and Goth Girl. 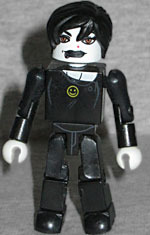 Kyra is dressed as she's described in the first book: all-black clothes, white makeup, black lipstick, a lip ring, a red nose stud, and her trademark "reverse smiley face" necklace (black body, yellow outlines). She has short black hair (a new piece), and tampos on her chest to show that she has clothes, not just a black torso. If the combo of all-black clothing and super-pale skin sounds familiar to you, that's not a coincidence - both books in the series have a lot of comicbook-related content (author Barry Lyga used to work at Diamond, which probably also explains how a novel got a Minimate), and Kyra's "Goth Girl" persona is directly inspired by Death! That's why I picked this Minimate up at Baltimore Comic-Con years back - she hangs out with the rest of my DC Minimates. The book(s) she comes from are good, but it's not like there's a Fanboy or Jecca on the way. And while we're also never going to get more of the Endless, she'd probably appreciate the promotion.